Is a pharmacist available to answer clinical questions? A pharmacist is available 24 hours a day, seven days a week to answer any clinical questions or concerns you may have regarding your medications by calling the pharmacy’s store number at 234-251-1105. For prescription status or questions about insurance coverage, etc., please call your pharmacy during normal business hours. If you feel that you are experiencing a true medical emergency, we advise that you call 911 immediately. How do I place a prescription order? Your prescription can be dropped off in person at Oak Clinic Pharmacy. You can also ask your physician to fax or send electronically your prescriptions to us directly. We will do all of the work for you – we contact your insurance company and determine what your coverage is, and then will reach out to you as soon as we know what your financial obligation is. We will even try to find some financial assistance through co-pay cards, if applicable. How do I obtain a refill? 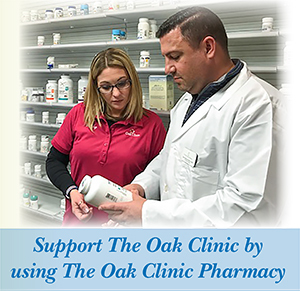 For specialty medications, as part of Oak Clinic’s Patient Management system, one of our technicians will reach out to you directly about a week before you are scheduled to run out of your medication. We will ensure that you are feeling well, are not experiencing any side effects, and will connect you with a pharmacist if you have any questions. Finally, during the call, we will schedule the refill for you. We can even take care of refilling any non-specialty medications at that time as well. How do I access medications in case of an emergency or a disaster? If there is an emergency or a disaster, Oak Clinic will make every effort to ensure that you do not experience an interruption in your medication regimen. If possible, we obtain an override to fill the prescription early if there are anticipated delivery delays. We could arrange to have to medication delivered via a courier service, or we could transfer the prescription to a different pharmacy, if either of those that would make sure you receive the medication in a more timely manner. How do I check on the status of my prescription? You can check on the status of any of your prescriptions filled with Oak Clinic during normal business hours. Please call local Oak Clinic pharmacy number, and one of our technicians would be happy to update you on the status of your prescription inclusive of insurance status, shipping status, etc. What information do I need to know about prescription substitutions? Please know that whenever financially beneficial to our patients, Oak Clinic will institute prescription substitutions (unless specifically stated otherwise by a physician). If it ever became necessary to transfer a prescription, for example, if I was relocating, how would I go about accomplishing that? If a transfer situation arises, please call Oak Clinic pharmacy, and we will work with you to transfer the prescription to a pharmacy that best suits your needs. What if a medication is not available at Oak Clinic, what do I do? If there is a medication that cannot be dispensed by Oak Clinic, we will find another pharmacy to which we can transfer it. We will do all we can to streamline that process for you, making it as uncomplicated as possible. What do I do if there is a medication recall? If there is ever a medication recall, Oak Clinic is notified immediately by the FDA and/or the manufacturer. In turn, Oak Clinic will reach out to you directly to inform you of the recall, and determine whether any of the medicine has been taken, and what to do if that is the case. You will be instructed not to take the medication, if you haven’t. We will send you directions and packaging to return the medication back to Oak Clinic. How do I dispose of my medications? If your medications are injectables, you should dispose of the needles in the Sharps container that Oak Clinic sent with your initial shipment. Please call your local county government to determine when and how pick-ups are managed. What do I do if I experience an adverse reaction? Please never hesitate to reach out to Oak Clinic at any time if you experience a reaction to your medication that is concerning. Our pharmacists can help you manage side effects. Depending on the severity of the reaction, you should always call 911. How do I report concerns? Or if I determine there was an error? If you have a concern or a grievance, please call your Oak Clinic pharmacy directly and report the details. Each complaint is investigated and resolved within 10 business days. If you suspect an error, please call the the Oak Clinic at 330-896-9625. Each error will be mitigated immediately, and you will be guided through the resolution process. For instance, the medication will be replaced if necessary.